My parents once lived in State College, Pennsylvania. (I lived there as well. I went to Penn State.) They have since moved on, but friends, football, and an all around wonderful town has them returning fairly regularly. I benefit from these visits as well. You see, for years my mother bought me handmade soaps from a local artist. When my parents moved, I figured I’d have to say goodbye to these little treasures. And, Internet, if there’s one thing you should know about me it’s that I love handmade soap—about as much as I love candles, cupcakes and cats. I’m always in search of an earthy smelling, handmade soap. I have ordered from a few artists with shops on Etsy and I was a little disappointed with what I got. The bars either all smelled the same (even though they claimed to be made up of different ingredients), or they were too oily, or they didn’t really smell much at all. Nothing, thus far (although I know there are many I haven’t tried yet!) 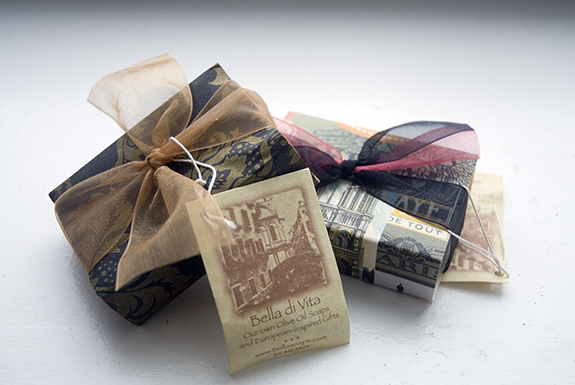 have come close to Bella Soaps. The good news is, to this very day, my mother still manages to pick up a bunch whenever they visit. And the even better news? Jennifer is now online! Previous Post Toddler Potty Training. Reader's Email. Next Post Emory On So You Think You Can Dance. Looks like nice stuff. My sister goes to PSU, maybe I’ll check this place out the next time I go to visit. I knew you went to Penn State, but I wasn’t aware that you were originally from the area. I grew up an hour east of State College in the Susquehanna Valley area. Nothing like Central PA! Those soaps sound wonderful. What is your favorite? I’m a sucker for handmade soaps too. Are those from the little shop in Boalsburg, a hop, skip, and jump away from State College? I remember going there a few years back and getting lost in the aroma. Jessica: I didn’t grow up there. We moved there when I was in 10th grade. Sorta lived there! Alyssa: yes! It’s in Boalsburg. Great little town, eh? Michele: can’t really go wrong to be honest. I have yet to find one I don’t like. If you ever need/want anything from there, just let me know! You should try making soap. It’s not that difficult and you get to pick and choose ingredients that benefit your specific skin type. My fave ingredients are olive oil and cocoa butter.